After Autumn lips and thick jumpers one of my favourite things about this time of year is darker nail colours. I always seem to gravitate towards the plum shades; whilst having a look through my stash i've picked out 5 polishes that I think are perfect for this time of year. I think a good, bright pink can look great this time of year. Two great transitional shades are the Sinful Colors polish in Boom Boom which is an almost purple toned pink, and Essie Watermelon which is a more red toned pink. 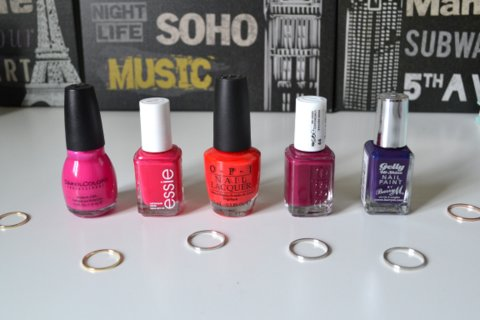 Both are lovely, bright, glossy shade which look amazing on the nails. Next is a good red; a favourite of mine is the OPI polish in Red Lights Ahead.. Where? This is a more orange toned red which again looks bright yet polished on the nails. My favourite plum coloured polish has to be Essie Bahama Mama. This is always one I reach for this time of year and I think it's just the perfect Autumn polish. My favourite dark option is a deep purple colour as it's not as harsh as a black yet gives a similar look to the nails. A great one is the Barry M Gelly Hi Shine polish in Blackberry; this is a lovely, glossy purple shade which you can almost get away with only one coat. So those are my top 5 Autumn polishes, I can see myself reaching for this a lot in theses colder months. What are some of your favourite shades and polishes to wear in Autumn? Revlon Colorburst Matte Balms - Reviewed! Rimmel Brow This Way in Blonde - Reviewed! The Body Shop All In One Instablur - Reviewed!